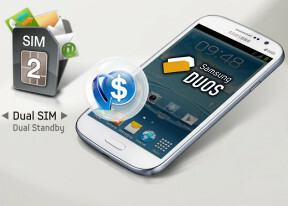 The Samsung Galaxy Grand runs Android 4.1.2 Jelly Bean out of box, skinned with the latest TouchWiz launcher, dubbed Nature UX. Its user interface is basically identical to that of the Galaxy S III mini and S II Plus, which is hardly a surprise given that the two share the Grand's Android version and screen resolution. Beyond the obvious benefits to the user experience compared to stock Android, a clearly midrange handset takes advantage of the same premium combination that powers the Galaxy S III and the Galaxy Note II. The lockscreen is a standard "tap and drag in any direction to unlock" affair and there're ripples accompanied by water-drop sound as you drag your finger. There are a number of additional unlock routines provided also - motion, face and voice among them. There're three customizable lockscreen shortcuts, and you can drag one to activate the corresponding app. That there are only three is rather odd since on the Galaxy S III there are five, and it has a smaller (albeit higher resolution) screen. The dock at the bottom of the homescreen fits five custom shortcuts. The rightmost one always opens the app drawer, but the other four can be set to any shortcut or even a folder. The notification area is quite feature-rich and offers quick toggles for Wi-Fi, GPS, Silent mode, Screen rotation, Bluetooth. You can swipe to the side to get even more: Mobile data, Blocking mode, Power saving and even Multi-Window support. Below the toggles is the brightness slider, complete with an automatic mode checkbox. There are also a couple of other useful things like the Settings shortcut in the upper right corner, the time/date to its left and the carrier name at the bottom. This being Jelly Bean, you get expandable notifications to get more info. You can expand and collapse them with a two-finger swipe and the top one is expanded by default (if the app that put up the notification supports it, of course). The app drawer accommodates both app shortcuts and widgets. Unlike stock Android, you cannot move between tabs by swipes - you have to explicitly hit the widget tab. Some will find this more logical (scrolling past the available apps to find yourself in the widgets takes some getting used to). The app drawer has three view modes - Customizable grid (where you can freely rearrange icons), Alphabetical grid and Alphabetical list (this one makes shortcuts easy to hit, but isn't very space efficient). You can also view just the downloaded apps by hitting the Downloaded apps icon. Once you get several apps running, you can use the task switcher to go back and forth between them. It's a Jelly Bean-style vertical list with a screenshot and a name for each app. Swiping an app sideways removes it from the list. Most notably, the dual-SIM interface is what's been added to this particular Galaxy that we haven't seen on most others. It is an interface that we've seen before on previous dual-SIM Galaxy phones, allowing you to select which SIM card you wish to dial numbers from (which displays as a number on the taskbar), as well as which SIM's data service network to use. You can also quickly switch between both SIM cards from the notification area. Overall, the Nature UX on top of Android 4.1 looks great and the Galaxy Grand does pack most of the cool software tricks of its more robust predecessors. It's rare to see a midrange device having most of the flagship's bells and whistles. And despite the lack of a quad-core chipset, the Galaxy Grand handles the heavy Samsung skin equally well. It didn't choke on heavy live wallpaper either. With the Galaxy S II Plus, we saw Samsung introduce what will likely be used in its future budget and midrange handset lineups. The Grand features the same dual-core 1.2 GHz Broadcom chipset. While both clocked the same as many previous Samsung devices, the architecture is slightly different, so we expect to see slightly different results. The BenchmarkPi single-threaded CPU calculations test lands the Grand towards the bottom of the pack, but that's expected against mostly higher clocked processors. In Quadrant, the Grand again beats out the Galaxy S II Plus, and falls in just behind the quad-core devices in our test. Both Broadcom-powered devices are miles ahead of the original Galaxy S II. GLBenchmark runs off-screen at 1080p resolution - putting all our tested devices on equal footing. The Broadcom VideoCore IV HW GPU failed to beat the Mali-400MP inside the Galaxy S II, but stayed pretty close to it, nonetheless. Finally, the SunSpider and Browsermark benchmarks gave us some great results. Given all the recent Jelly Bean optimizations to the web browser this was almost expected, as the Grand comes just behind the flagship Galaxy S III.